What is the B.Sc. Global Designation? The Faculty of Science B.Sc. 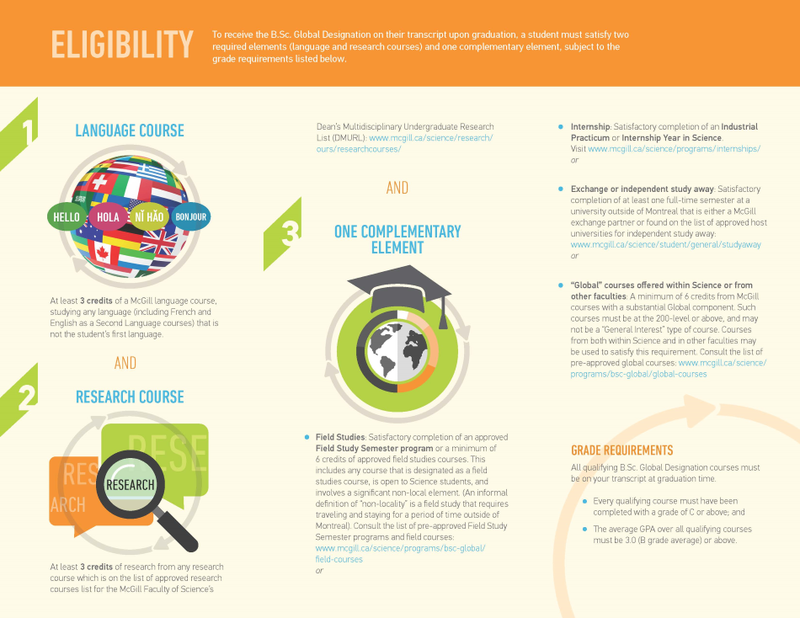 Global Designation recognizes Bachelor of Science (B.Sc.) students who have gone beyond a typical B.Sc. experience by broadening their horizons through participation in language classes, the performance of independent research, and including the "real-world" (global-related study and/or non-McGill study or work experience) in their program. Eligible students will have the mention "B.Sc. Global Designation" added to their student record and transcript at graduation. Language Course: At least 3 credits of a McGill language course, studying any language (including French and English as a Second Language courses) that is not the student's first language. Research Course: At least 3 credits of research from any research course which is on the list of approved research courses for the McGill Faculty of Science's Dean's Multidisciplinary Undergraduate Research List (DMURL). Field Studies: Satisfactory completion of an approved Field Study Semester program or a minimum of 6 credits of approved field studies courses. This includes any course that is designated as a field studies course, is open to Science students, and involves a significant non-local element. (An informal definition of "non-locality" is a field study that requires traveling and staying for a period of time outside of Montreal.) A list of pre-approved Field Study Semester programs and field courses is provided. To apply for a course not currently found on the pre-approved list to be added to the list, please send a detailed course outline/syllabus to the B.Sc. Global Designation Coordinator before the deadlines indicated below. Internship: Satisfactory completion of an Industrial Practicum or Internship Year in Science. Exchange or independent study away: Satisfactory completion of at least one full-time semester at a university outside of Montreal that is either a McGill exchange partner or present on the List of Approved Host Universities for Independent Study Away. "Global" courses offered within Science or from other faculties: A minimum of 6 credits from McGill courses with a substantial Global component. Such courses must be at the 200-level or above, and may not be a "General Interest" type of course. Courses from both within Science and in other faculties may be used to satisfy this requirement. A list of pre-approved global courses is provided. To apply for a course not currently found on the pre-approved list to be added to the list, please send a detailed course outline/syllabus to the B.Sc. Global Designation Office before the deadlines listed below. Transfer credits and the B.Sc. Global Designation? Courses taken at other institutions may be considered for application towards the B.Sc. 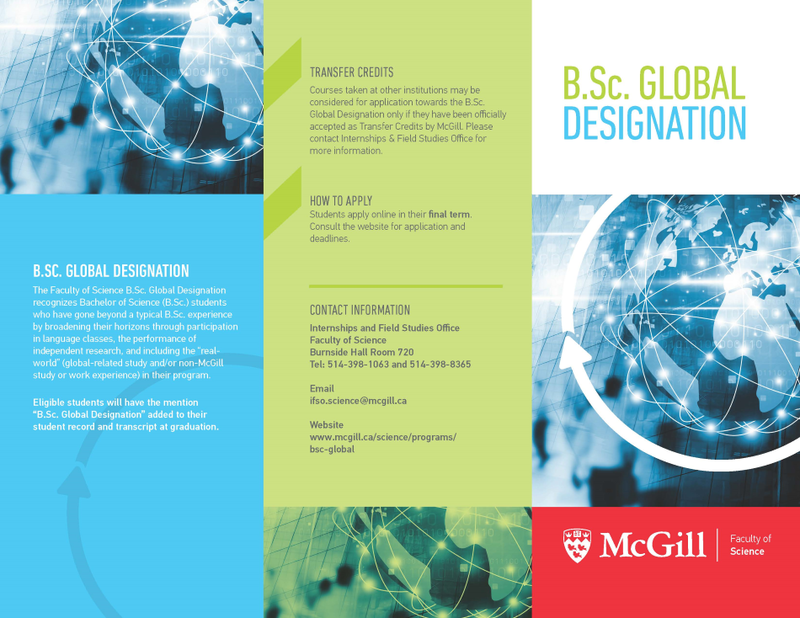 Global Designation only if they have been officially accepted as Transfer Credits by McGill. Please contact the B.Sc. Global Designation Coordinator for more information.